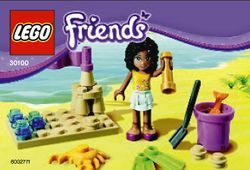 30100 Andrea at the Beach is a Friends set released in 2012. It has been available on October 13, 2012 in the United Kingdom as part of the fourth The Sun / News of the World Promotion. The set consists primarily of a large set of accessories, but a sandcastle is included as well. Set on a 4X6 section of beach, with waves lapping at it, the sandcastle is a small conical construction, with a purple flag set at its peak. A tan 1X1 stud is placed next to it. The accessories included in the set are as follows: A golden telescope, a black shovel, a purple bucket, a yellow crab, two lime green flippers, an orange fish, and two tan 1X1 studs. Facts about "30100 Andrea at the Beach"
This page was last edited on 29 August 2016, at 19:45.